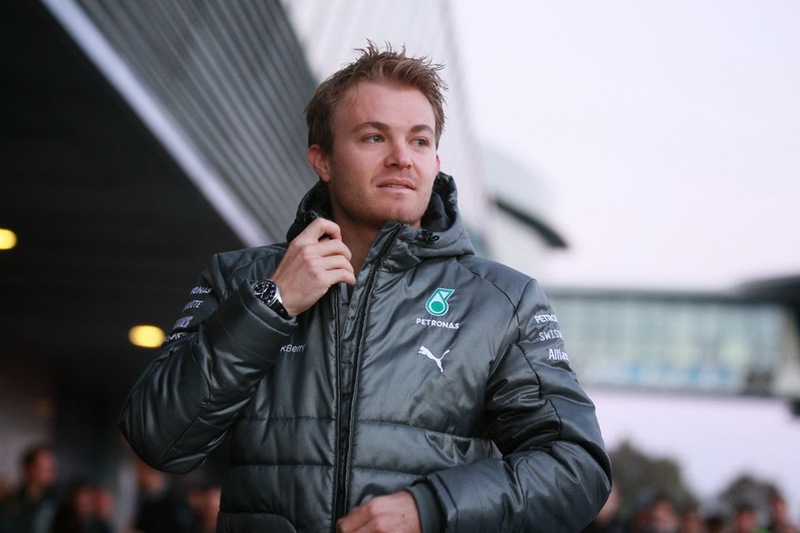 Talking about F1: The F1 blog: F1 2014 Season Preview: Mercedes - Silver into gold? 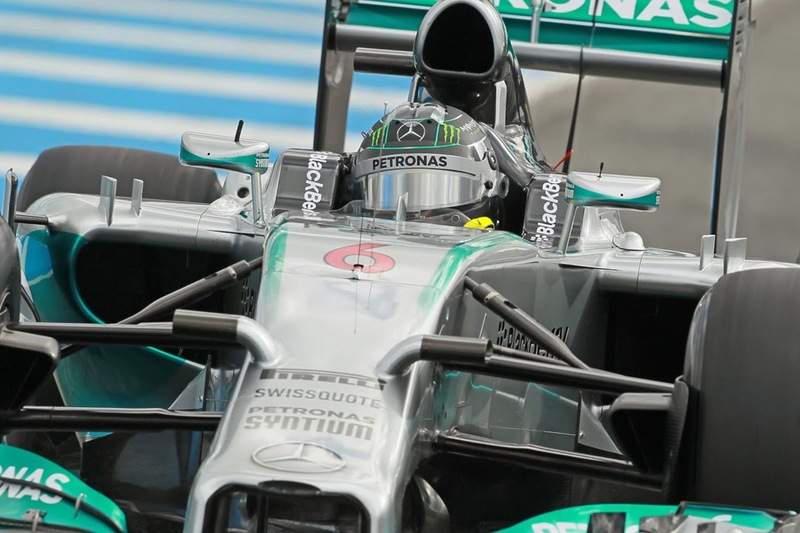 F1 2014 Season Preview: Mercedes - Silver into gold? Pre-season testing is cryptic enough at the best of times, as we're forever being reminded. And this year's variety has the potential to be much more cryptic still: radical rule changes render the form of previous years close to irrelevant, and will likely vary the programmes being run - and in turn the topline lap times - even more than usual. But despite this we've had something close to unanimity out of 2014's running on who's on top: the Mercedes is the best power unit of the three, and of the Mercedes-powered runners the eponymous works team is as things stand clearly poised as the team to beat. The Mercedes team has visibly been far ahead of the rest in terms of its preparation and programme. The W05 has covered more mileage than any other car, and seeing a Mercedes circulating alone, perhaps joined only by a McLaren, was a common sight in the opening two tests. In Jerez only the Merc did a race simulation run, while uniquely in the first Bahrain test it indulged itself with a quali-type run too. And even more important all of the evidence is that the car is the quickest too. The W05 visibly is just about the most benign out there, suggesting the car's supremacy is not simply down to the engine, while the engine note itself sounds the clearest, even compared with the other Merc runners. And it's all transferring to the bottom line of the lap times: its longer run pace has been strong while the afore-mentioned quali run sent a shiver up the paddock looking for a spine to run up: Nico Rosberg's mark was within a second of his pole time at the same venue last year and a few reckoned he'd have been even closer had he access to the gumball tyres of then plus had he really nailed the lap. And to think that some in other teams were muttering that the new formula was going to be hideously slow (Kamui Kobayahsi's commented that he'd be better off with a GP2 car than his Caterham). All in the Mercedes team - as is usually the way for a squad that's on top - are doing their best to conceal their glee and to downplay expectations, but their glow of satisfaction cannot be hidden. It is therefore no surprise that you'll struggle to find those within the fraternity predicting something other than a Mercedes to win in Melbourne. Some even have them running away there. Whatever is the case, the rest appear to be in catch-up mode. As is always the way in F1, everything happens for a reason, and the state of the Merc shouldn't be a surprise. The team has had the rule changes for 2014 circled in its diaries for a good long while: its V6 turbo unit was running on the dyno as long ago as early 2012 while even in that 2012 season the team gave up on the year early so to shift resource onto its 2014 effort. All of this lest we forget was crucial in encouraging the mighty Lewis Hamilton to get on board too. The marque's financial investment has been considerable also, just as it was with the sport's first foray into KERS in 2009 and then it produced by consensus the best system. While the technical team, that Ross Brawn painstakingly put together and bore fruit for the first time last year, are of the quality to make best use of it all. Little has been left to chance: the whole package - engine, gearbox and energy recovery system - was running on the dyno together and in representative conditions (including aping a Grand Prix weekend of three practice sessions, a qualifying session and race) months ago, identifying and sorting the problems that perhaps those with a more of a plug-in-and-go approach have been discovering on track in testing. More broadly, the Brackley team last year raised its spending to much closer levels to those of Ferrari and Red Bull, having previously reduced it assuming its rivals would follow suit in the spirit of resource restriction. While as predicted being an engine supplier's works team, and having the most potential to develop the power unit and its cooling package in unison, appears to be crucial. Ferrari similarly looks to be ahead of its customer teams. Perhaps the only thing that can stop Mercedes sweeping the board in the opening round is unreliability, and it might not merely be a forlorn hope for its rivals as the Merc's running in pre-season has been peppered by technical stoppages (as it has been for just about everyone). Additionally, while the car looks quicker now it also is by consensus further down the line in preparation, which leaves open the possibility of other cars being as quick or quicker once they reach that point on their own learning curves. And further ahead, just how the team does without the genius Ross Brawn - having left in the off-season unhappy with the management structure changes put in place by Toto Wolff and Niki Lauda at the start of last year - remains to be seen. The team's management-by-committee structure is also one that the sport has shied away from traditionally, though it coincided with an upturn in 2013 and perhaps it makes sense in modern vast, multi-faceted F1 to spread the burden to more than one person. McLaren for one appears to be taking inspiration from it. But all that lays ahead. For now, the all-pervading question being wrestled with up and down the paddock is how exactly to fly faster than the Silver Arrows. The question had lingered in F1 for some time: 'just how good is Nico Rosberg?' We all knew he was good, but was he top drawer as some claimed, or perhaps more characterised by being consistent and solid, a minor upgrade on Nick Heidfield if you will? The matter was clouded rather for years by Nico having access to a series of disappointing cars as well as a succession of team mates - Mark Webber aside in his debut year of 2006 - not providing an unambiguous yardstick. But in 2013 we were bound to get an answer, placed as Nico was alongside the inimitable Lewis Hamilton. And you know what, it turns out that Nico Rosberg is very good indeed. Over the course of last year's campaign there was next-to-nothing to choose between the two Merc pilots; while Lewis finished up with 18 points more that largely can be attributed to Nico monopolising the Merc's technical failures (having three such stoppages in races to Lewis's none) as well as to losing out via infamous team orders in Malaysia. When both finished they were matched eight apiece on being ahead, and of course Nico had the more race wins, two to one. And it was no cruise and collect from Nico, he pretty much went toe-to-toe with Lewis on pace too. Lewis admittedly has his troubles settling in, especially with his feel for the car's brakes (and braking was often Lewis's trump card in his McLaren days), but still Nico's efforts are absolutely not to be belittled, facing off as he was with a driver who has left a few team mates gasping and thoroughly bewildered by his sheer pace. Arguably only Alonso got as close. Arguably not even Alonso did. And the received wisdom is that the new formula this year will suit Nico. That it's complex, with countless new stuff to get your head around, plus that restraint and guile may be required with in-race fuel management, all will likely suit Nico's cerebral and technically-minded approach just fine. But it remains the case that Lewis will still be Lewis, the devastating raw pace will be in there that not even Nico will in all probability match when it's all at full chat. While matching a Lewis with the smell of a championship in his nostrils will likely be a completely different challenge to matching Lewis fighting for scraps as he was last year. While if one is to look for flaws, Nico did have the odd off weekend in 2013, wherein weekends that started bad tended not to improve. Fighting at the front such things are likely to be punished more ruthlessly. Plus Lewis will now have had an extra year to get his feet under the Merc table, and to influence the car's development more towards his tastes. Yet whatever is the case, even if the Mercedes runs away in 2014 the matter of which Mercedes prevails is no foregone conclusion. And how implausible that would have sounded 12 months ago. Will the golden egg that Lewis Hamilton laid in a Singapore hotel room way back in the September of 2012 hatch in 2014? Lewis surprised everyone, perhaps even himself, when he made his sudden about turn in the said hotel room following Niki Lauda's 11th hour plea, and chose to turn his back on the (then) safe bet McLaren squad to throw his lot in with the (then) perennial underachiever Mercedes. Most thought he'd just committed career suicide, but within the twister of denunciation at it all somewhere at its epicentre there was a, perhaps solitary, redeeming feature: come 2014 and the rule changes, the conventional wisdom went, the Mercedes team would be well-placed. But rather rapidly in 2013 Lewis's choice looked inspired, and a year ahead of time. As McLaren flopped Mercedes confounded almost everyone by suddenly starting to deliver on its potential, with the silver car, certainly pre-summer, being a consistent standard bearer on raw pace and only scuppered in the main by its struggles to keep the delicate Pirelli tyres in order. Even so, Lewis's campaign was rather one of peaks and valleys. Much of his instinctive ability and devastating pace was on show, such as in his win in Hungary and his comeback drive after a puncture in Silverstone, arguably the two best drives by anyone last year. They were on show too during his mid-year run of four pole positions. But for much of the time he looked a little off his best, as well as was transparently a little flummoxed by his not always getting onto Nico Rosberg's pace. He wasn't helped by a change from the Akebono brake calipers used by McLaren, with Lewis not having the same feel for Merc's variety which diminished his strong suit of braking ability (it possibly was not coincidental that neither Silvertsone nor the Hungaroring feature many big braking zones). Equally he wasn't helped by a cracked chassis later in the year. Lewis furthermore displayed conspicuous and often baffling emotional swings out of the car too, with a tendency to beat himself up as well as to treat media microphones as something of a confessional. 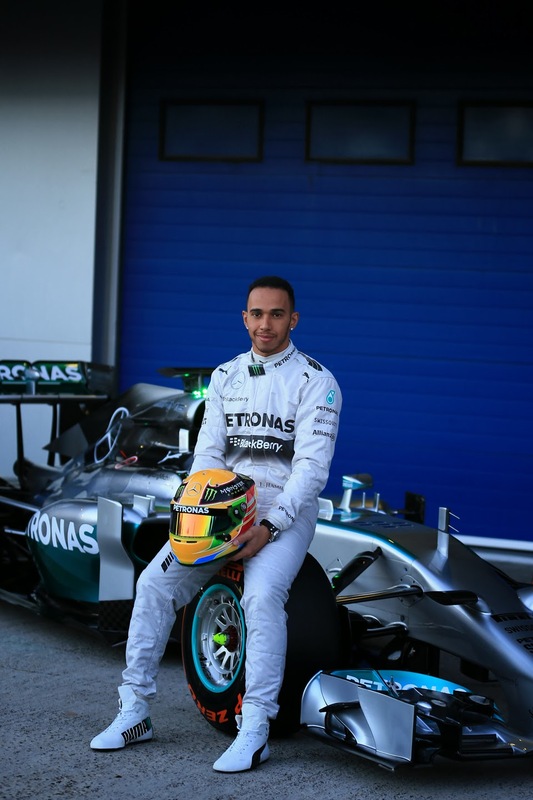 Some who have worked with Lewis closely said that such negative moods have a similar negative impact on his driving. They certainly seem in stark contrast to the ability of the likes of Schumacher, Vettel and Alonso to maintain a positive mindset. Many wonder too if the fuel conservation formula of this year will, as the tyre nursing of years past did, rather chafe against Lewis's press-on instincts and dull his abilities in sheer speed. Perhaps it won't help, but equally perhaps we underestimate Lewis in such things: after all, in 2012 he appeared to master such requirements in Pirelli conservation while retaining his pace and flair, such as in Barcelona where he did the longest single stint of anyone that year and he was still quick. One way or another the plan that Lewis plotted in Singapore the year before last appears have come together beautifully, and he looks finally set to have the car advantage denied to him - mainly by Red Bull - ever since he won his title in 2008. He also has more durable tyres as well as a team beholden to him in addition to his rapid set of wheels. Everything appears to be in place in other words. Now it's over to him.